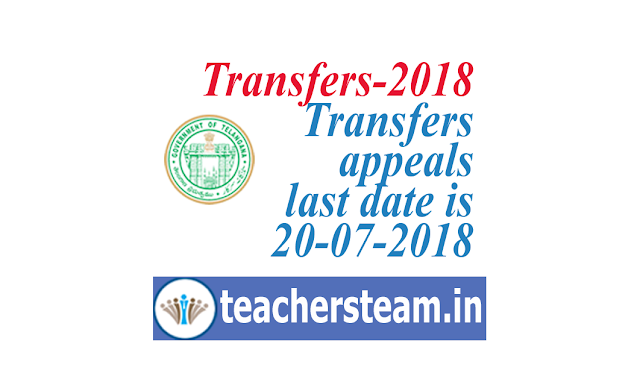 All the HMs/Teachers in the state are hereby informed that an appeals receiving counter was constituted in O/o DSE,TS, Hyderabad for submitting their appeals against their transfer orders issued by the concerned RJDSEs. All such appeals received in this office will be consolidated and wil be disposed off after 24-07-2018 and further, appeal disposal orders will be sent to the concerned RJDSEs, they inturn issue orders as per this office decision. Further, they are informed that appeals receiving counter willl be functional in this office from 4 PM to 6PM only till 20-07-2018. Hence they are requested to follow the instructions strictly.